Now this is getting interesting, and everyone who keeps saying that MMORPGs are dead please take notice. There is a new MMORPG based on The Lord of the Rings in development for PC and consoles, and it is going to be free-to-play. Unless something happens in the meantime, it will run concurrently with The Lord of the Rings Online, a game based on the same IP. 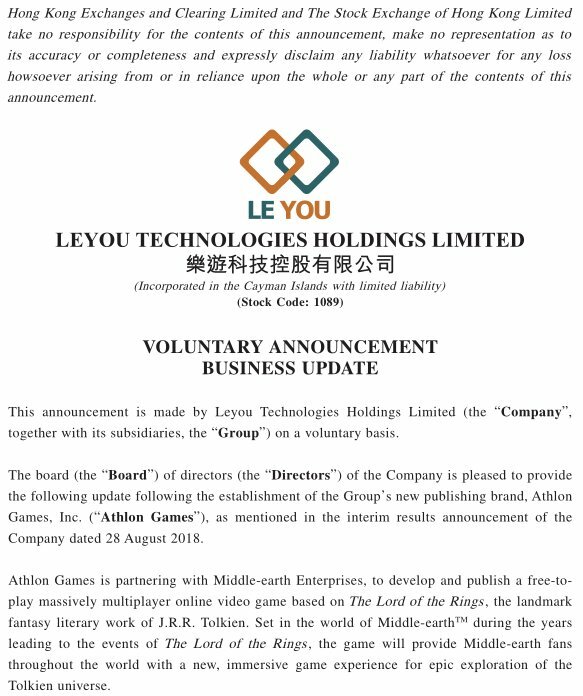 Hong Kong-based publisher Leyou Technologies revealed the news, and if this outfit sounds unknown, you should know that it has heavily expanded lately, having acquired Warframe's developer Digital Extremes in 2014 as well as Dirty Bomb's developer Splash Damage in 2016, and owning US-based Athlon Games, the developer of the new Middle-earth MMORPG. This studio was established earlier this year and plans on creating “AAA cooperative console and PC experiences that gamers will want to play for many years.” Athlon has partnered with Middle-earth Enterprises for the development and publishing of this free-to-play massively multiplayer online video game based on The Lord of the Rings. As for the new MMORPG, there isn't much info to go about, but we know that it is going to be set in the world of Middle-earth during the years that preceded the events of The Lord of the Rings, providing players with a “new, immersive experience for epic exploration” of Tolkien's acclaimed universe. It's too early to get a name or a release date for this MMORPG, and the first actual info is probably many, many months away. In another news, Leyou Technologies is also working on Transformers Online and Civilization Online. You may remember that these games have in fact already existed – we're not even sure where to place this Transformers Online game by Tencent). As for Civilization Online, it was developed by ArcheAge's makers XL Games and shut down in late 2016. The new games are being developed by Certain Affinity (Transformers Online, licensed from Hasbro) and Guangzhou Radiance (Civilization Online, licensed from Take-Two).